What's the best sat nav app for iPhone and iPod touch? The iPhone is a perfect sat nav device. Small enough to sit discreetly on your dashboard, but big enough that you can glance – rather than squint – at it, all you need now is the perfect app to use with it. A quick search of the App Store will show you there's lots of choice, from free ones to apps costing over £50. So we've picked four of the big players: TomTom, Garmin, CoPilot and Sygic, as well as one cheap alternative: Navmii GPS Live UK. When you're choosing an app, think about where in the world you're likely to use it, and buy the correct version. And remember that while you don't need an internet connection to use these, since the maps are stored on your phone, you will need it for live traffic information. If you've ever had a car with a built-in sat-nav, the experience of using the iPhone is somewhat different. The main change is that with a built-in sat-nav you've got physical buttons and dials to control it. This means you can, for example, zoom in or out of the map while you're driving, without taking your eyes off the road. There's no doing that with the iPhone, however, because your screen's a single flat surface. You really need to set it up while you're stopped, then put it in the mount and leave it to do its thing as you drive. With the iPhone, you're pretty safe to save your 'Home' location, since you're not going to be leaving your iPhone in the car, and because you can pop a passcode on your phone to keep its contents safe. One thing to make sure of is that when you reach your destination and exit the satnav app, it stops using Location Services. If the compass arrow remains in the top bar, it's still accessing your location and will run the battery down. Go into the app and tell it to stop navigating, or, from the Home screen, double-tap Home, tap and hold the icons to make them wiggle, then tap the minus sign on the sat-nav. You need a sat-nav to be there to help you in the most confusing and tricky places to find your way around, so what better place to test them than our home town, Bath? Full of one-way streets and bus-only roads, as well as some streets that were redesigned in the last few years as part of a major building project, it presents a real acid test for any sat-nav app. We started our test at home, up on the northern slopes of the city, and asked each app to take us to a local point of interest – in this case, a petrol station on the edge of the city centre. From there, we wanted to visit a friend whose address (but not the postcode) was saved in our iPhone's Contacts list. After that, we tried a straight postcode lookup to take us to a local National Trust property, Prior Park Landscape Garden. Once we'd looked around there, we made our way towards the main railway station, and then back home. This route was specifically designed to test the different ways of setting your destination, as well as the app's knowledge of prohibited roads. There were two such roads in the test, one of which, the Ambury, allows cars for loading only. While there's no active enforcement of this rule, as good law-abiding citizens we wanted the sat-nav to steer us away from it anyway. The second forbidden road was the bus gate at the top of the High Street, which has an enforcement camera on it. Despite this, several of the apps still tried to send us through it, which would have resulted in a hefty fine had we followed the routing. In both cases, we followed the suggested route as far as possible (shown as dotted lines in our maps) and then turned off, to test the apps' ability to reroute us. Obviously, the apps' routing accuracy will vary in different places throughout the country; this is just an example. Despite its Premium name, this is one of the more affordable apps on test here. Though its interface, doesn't look particularly iOS-like, it's simple enough to find your way around. But as you make your way through the menus, it lacks some of the polish and smoothness of the TomTom or Garmin apps. Scrolling's a little jerky and there's sometimes a delay before menus appear. These are minor gripes, but it's things like this that set the great apps apart from the ones that are merely good. The display when you're driving looks pretty, though the fonts used are a tad on the slim side for glancing at when you're driving. Some braver, chunkier bolding wouldn't have gone amiss. Similarly, the so-called Driving Menu, which gives you access to various on-route options, has nice, big, easy-to-press buttons, marked with big, clear symbols, but the font on the labels is too small to read without peering in closely. Having got all that off our chest, there's a lot here we do like. When you're stationary, for example, it adds local points of interest to the map. But, knowing this adds clutter, these vanish again as soon as you pull away. The spoken instructions during our test were a mixed bag. The ones it gave us in advance of a junction or lane change were inferior to both TomTom and Sygic, but we found the 'now' directions ('turn left now') were given at the perfect time. The voice giving the instructions, like on all the apps except Sygic's, was a little mechanical, especially when pronouncing road names. And this was the only app other than TomTom that, as far as we could tell, made use of the GPS in the TomTom Car Kit, meaning that it should work on an iPod touch as well, but check this before you buy. The live traffic updates cost a bargain £8.99 for a year's subscription, and show up at the side of the screen. Can the new kid in town give the rest a run for their money? Garmin is no stranger to the world of satnavs, but it's the new kid on the block when it comes to the iPhone, the app having been out for a matter of weeks when we tested it, and still at version 1.0. We love the simplicity of the main menu: two big buttons, with some smaller ones down the side. It's easy to find your way around the app and to navigate to different types of waypoint. The interface looks very similar to what you get with Garmin's own brand sat-nav units, so if you've used one of them, this'll be second nature to you. But even if you haven't, it's quick to learn and feels remarkably slick considering it's the first version of the app. Though the map itself can be cluttered, the main interface is, happily, nice and simple. A big instruction, your estimated time of arrival, a prominently displayed speed limit, your own speed (which turns red if you're going too fast), and a traffic button are all you get, and it's absolutely great. The route you need to follow is marked in bright pink, so it's easy to tell apart from the surrounding roads, and there's a quick-access button to the live traffic information, if you've subscribed. This'll cost you £2.99 a month or £21.99 for an annual pass, and the app automatically routes you away from traffic it detects. It also zooms in and out of the route when it feels this is useful. We commend Garmin for including lane guidance in towns and cities, rather than just on motorway junctions. It wasn't always perfect, and was a little bit small, but it's a useful addition. The same could be said for the speed camera warning, which plays a sound and pops up on the screen, though the writing is too small to read from a distance. In time, we learned what this combination of sound and a grey blob on the screen meant, but a simpler and larger camera symbol would work better, we feel. The guidance voice could also do with some work, but this is an excellent offering nonetheless. At less than half the cost of some of the others here, you'd be forgiven for thinking that Sygic's app might be found wanting in comparison to those with heftier prices. But it impressed us on multiple fronts, starting with the menus you use to tell it where you'd like to go. The buttons are big, making them easy to press, and they feel polished. This wasn't the only area where Sygic impressed us, though. The default voice that reads out instructions is by far the most natural-sounding of all the apps. Using it was more like having a friend in the passenger seat telling you where to go, rather than a mechanical-sounding robot. The instructions that the voice gave us were impressive too, especially the 'keep left/keep right' lane guidance. Our test route contained lots of two- and three-lane roads, and sometimes knowing which to be in is baffling, even for those of us who have been driving in Bath for some years. Yet the lane guidance, with one or two small exceptions, pointed us to the lanes that our experience would have led us to choose. The on-screen map that you see when you're driving is kept minimalist, which we also liked: it's easy to find the particular bit of information you're after, and the speed limit is always prominently visible. If you subscribe to the live traffic information from INRIX (€9.99 per year for the UK), you get a little symbol in the other corner of the screen, telling you if there are any delays on your route. We'd have liked this to be bigger, but it's simple to get at. It wasn't all good news, though. Our biggest complaint was that the colouring of the map at times made it tricky to pick out your route from all the surrounding roads. We'd have liked to see more contrasting colours used here. The on-screen lane guidance is too small as well. And when we were trying to navigate to a contact's address, it listed our entire address book, rather than just those with addresses available. It also threw a strop when we put in a postcode with a space in the middle. Hmph. How does the sat-nav veteran stand up to the competition? TomTom's been doing the sat-nav thing for so long that it's almost become the de facto choice for navigation: you want a sat-nav, you get a TomTom. And as you use its iPhone app, you can tell it's a carefully refined piece of work. Feeling very at home on iOS, it uses big chunky fonts that are easy to read, even when you can only glance at the screen quickly. These permeate throughout the menus as well as the driving screen. The menus you use to tell it where to go are logically arranged and extremely smooth to use. The driving display is easy to read and uncluttered, with a good contrast between the directed route and surrounding roads. One thing we were less keen on was the way the name of the road you're currently on is displayed directly above the instruction arrow at the bottom, while the road you're looking for next is on its own at the top. It would make more sense to swap them round, so that a single glance would tell you you're looking for, say, a left turn onto Lower Mortlake Road, rather than needing to look at the bottom of the screen for the first part, then the top for the second. The voice is one of the better ones among the apps we tried. Though it's not as natural-sounding as Sygic's, it does a reasonably good job with road names and giving instructions. Live traffic information comes from TomTom's sophisticated system that anonymously tracks the speed of vehicles with TomTom devices on board, and combines this with information from other sources. It also incorporates historical traffic data, so if a particular road is always slow at rush hour, it takes this into account, too. If there's traffic ahead, it looks for a quicker alternative and informs you if it's found one. A month of use costs £3.99, while a year is £26.99. There are similarly priced options for speed cameras. And provided you use a TomTom Car Kit for the iPod touch, the app will work with this device, too. Just how good a sat-nav can you get for a few quid? One of the main reasons sat-nav apps aren't cheap is because of the map data that's required to power them. Companies spend a lot of money developing their maps, and you as the consumer pay for this. Navmii is different, because it uses OpenStreetMap, a free map of the world that's been made by people like you – the Wikipedia of maps, if you will. So although it's not perfect, if you do find a mistake, you can correct it yourself. And because it's so cheap, we can cut it some slack for its shortcomings as an app. It's missing a lot of the features that are standard in the others, such as contact lookup and some point of interest searches. We like the way its main menu is made up of big, chunky buttons, but the ease of use is spoiled somewhat by the tiny font beneath them. If you're going to be relying on a sat-nav a lot, we'd recommend one of the others, but if you only need it now and again, you could do a lot worse than to try Navmii's app. Having spent considerable time testing each of these, our conclusion is that if we were to jack in the day job and devote ourselves to crafting the perfect sat-nav app, we'd take elements from each one of these. From Sygic UK & Ireland, we'd want that incredibly natural-sounding voice and quality lane guidance, while CoPilot Live Premium chose the best route in our test. Navmii, given it's so cheap in comparison to the big boys, does a remarkably good job, too. And Garmin's first attempt at an iOS app is impressive; in a few updates' time, we can see it giving TomTom a real run for its money, particularly given its lower price point. But at the moment, TomTom's is the best iOS satnav app there is, because it's just so easy to use on an iPhone. The style and organisation of its menus make it simple to get to grips with. Options are where you'd expect them to be, while the buttons and fonts are large and bold enough to make them easy to read at a glance, without needing to peer in too closely – something that can't be said for all the apps here, by any means. 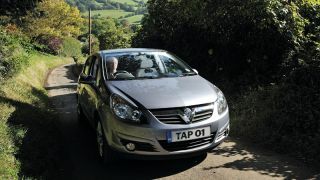 It isn't perfect – the routing around Bath wasn't ideal – and it's the most expensive one we tested. But having said that, we feel it's a price definitely worth paying for a slickness and polish that we've come to expect from good iOS apps, and its currently unrivalled among its peers. If you're going to be using a sat-nav a lot, go with TomTom, and get a traffic subscription. You won't regret it.